Reuben’s Brews has been through some big changes in the past year. They opened their new taproom at 5010 14th Ave NW, just two blocks from their previous taproom, which they retained as an ‘experimental’ brewery and barrel warehouse. They also brought on Dean Mochizuki (formerly of Pike Brewing Company) as their Head Experimental Brewer. In addition, for those who may not have heard, Reuben’s Brews was recently selected to brew the official beer for Seattle Beer Week 2016 (the style has not yet been announced). Now, along with all the other wonderful Fall and Winter beer releases that have been happening lately, Reuben’s is ready to release their 2015 Vintage Bourbon Barrel Imperial Stout (BBIS). In addition, they’ll be having a very special limited single-barrel release of this same beer known as ‘Barrel 7’. SEATTLE, Wash. (Dec. 9, 2015) Tis the season for one of Reuben’s Brews’ most popular beers. The 2015 vintage of our Bourbon Barrel Imperial Stout (BBIS) will be released in 22oz bottles at noon on Saturday, Dec. 19 in the taproom. In its brief history BBIS has already won a number of accolades from local beer lovers, and has won Gold Medals at the 2013 and 2014 World Beer Championships and at the 2015 Best of Craft Beer Awards. Another advantage of our expansion earlier this year is that we were able to brew more BBIS than last year – almost 75% more. This will mean more BBIS should be available to cope with the release day. Also, as we sampled each barrel of BBIS to get a feel for the blend we found that one was exceptional by itself. It displayed – unblended – all the character we were looking for: rich body, vanilla, bourbon, light oak, and smooth milk chocolate. Instead of blending that barrel into this year’s BBIS, we decided to keep it separate and bottle it by itself. We named this special unblended version Barrel 7, after the number on the barrel. As in prior year releases, bottles are $15 each and will only be available in the taproom on a first-come/first served basis. BBIS bottles will be limited to 4 bottles per person, per day. Barrel 7 has a limit of 1 bottle per person, per day. To celebrate the release, the Burgerphenia food truck will be onsite and we’ll have some special beers on tap, including a keg of both the 2014 and 2013 BBIS. Then at 4 p.m., we’ll tap our only keg of Barrel 7. Reuben’s Brews is a small, family-owned brewery located in the Ballard neighborhood of Seattle, WA. Since we opened in 2012, our beer has been awarded several local, regional, national and international awards. We won a gold and a bronze medal at the 2015 Great American Beer Festival awards, have been awarded 30 World Beer Championships medals, and were named Mid-Sized Brewery of the Year at the 2015 Washington Beer Awards. Our expanded taproom and production brewery opened in May 2015. 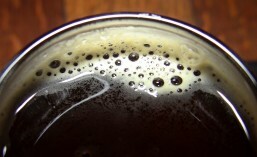 For more information, visit http://www.reubensbrews.com or follow us on Facebook and Twitter. As noted above, 2015 BBIS (and Barrel 7) will be available in 22 oz bottles starting on December 19th, when Reuben’s opens their doors at noon. Also, on that day, you’ll find 2014 and 2013 BBIS on tap to enjoy (along with a taping of Barrel 7 at 4 PM). I may just have to drop by and grab a few bottles to add to my own cellar. Bottle limits as noted above. This entry was posted in ballard, Beer, Beer Release, Blending, Bourbon Barrel, Brewing, Events, Fall, Food, Imperial, Limited Edition, Local, Rare, Seattle, Washington, Washington Beer, Wood Aged and tagged 2015, ballard, beer, Beer Release, December, events, Reuben's Brews, seattle. Bookmark the permalink.